A good ponytail never goes out of style. It is the perfect hairstyle for any occasion you can imagine. There are many fresh ways to upgrade this good old hairstyle. If you are tired of the basic pony, with a little patience you can have a new glamorous look that is approved by celebrities and hair stylists. Hair accessories, braids, and twists are just a few of the options. Here are some easy ponytail ideas that you can use to step up your game. You can add just one or more, you can make it thin or thick, the possibilities are endless. The final result can be a high or a low ponytail with a braid. Additionally, you can make nice waves to your loose hair. There are many super-cool braids that will give that edge to your look. 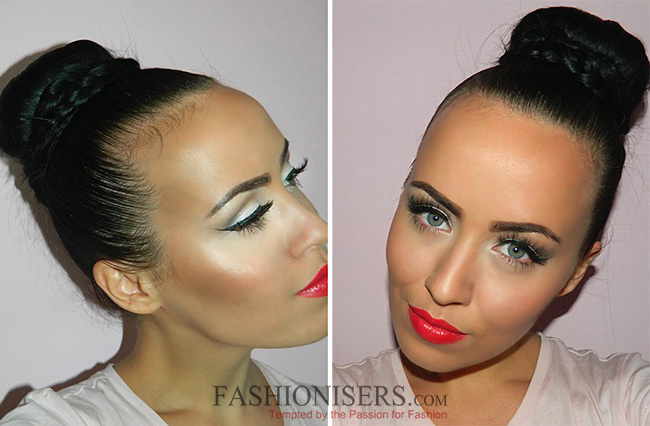 If you decide to try this look search for online tutorials so you can see how to recreate it. Celebrities such as	Beyoncé	and Jessica Alba have popularized the side ponytail on the red carpet. It can be a sky-high one with nice waves or a sleek low one with hair pulled on one side. Definitely, will give that Hollywood glam to your appearance. One of the greatest hits lately is the half-ponytail. Rihanna is probably the one responsible for this. Just tie the top half of your hair in a bun or in a pony and add a lot of volume. You can leave your hair straight, make it wavy or curl it in elegant curls. It’s perfect for any occasion, and you don’t have to be a professional hairstylist to do it. This super-cool look takes only 10 minutes and some elastic bands. First, you have to pull your hair up. The next step is to use elastic bands to divide the ponytail into sections. You can pull off each section to add volume to it. This hairstyle reminds of the one Princess Jasmine had in Aladdin. It is approved by the famous actress Olivia Wild that wore this hairstyle with bangs. The first thing that comes to your mind when you hear high ponytail is probably	Ariana Grande. The young singer has perfected the art of ponytails. This hairstyle actually became her signature one. The good news is that anyone can pull off this look. Just pull your hair back and tie it very high. Ariana sometimes does only half of her hair, and other times ties her whole hair. In both cases, her ponytail is on point. Another hit among celebrities is having a sleek and shiny pony. There are many hair products available that can help you achieve the shiniest pony ever. The best way to cover the elastic band is to use a section of your hair and wrap it around the base of the ponytail. Since Kim Kardashian was seen wearing extra-long hair extensions, the mile-long pony became an instant hit. Celebrities prefer the low, sleek and extra shiny pony. You can literally wear this hairstyle like an accessory. For this hairstyle, you probably need to own extremely long hair extensions. Cover the elastic band with a section of your hair or use a fun, sparkly hair accessory. This is the hairstyle for the braver and bolder ones. Christina Aguilera and Katy Perry are just a part of the influencers that tried this colorful hair trend. You can choose from many different colors and dyeing trends. You need to color strategic parts of your hair, and that will look amazing once you do that sky-high pony. Zendaya showed a whole new level of volume with her low pony recently. Since then everyone is going crazy over this super-voluminous hairstyle. The upper part of your hair should be sleek and smooth. To add volume to the pony just backcomb it and use a hairspray.